The booklover is distinguished from the reader as such by loving his books, and from the collector as such by reading them. My wife and I spent three weeks this month visiting relatives in New York. And we got some book-buying time in for me, and some antique-buying time in for her. 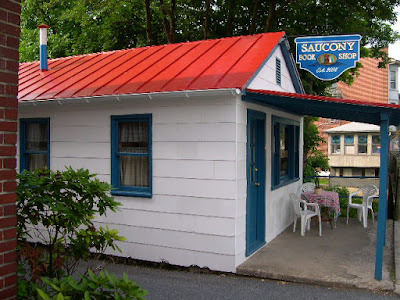 We took the western route up from Florida so I could visit what is touted as the smallest antiquarian book shop in Pennsylvania: Brendan D. Strasser's Saucony Book Shop in Kutztown, a town that had several antique stores as well. 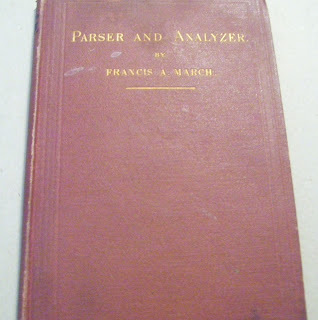 Only a fraction of Brendan Strasser's stock is located in his book shop. And he utilizes every inch of it. 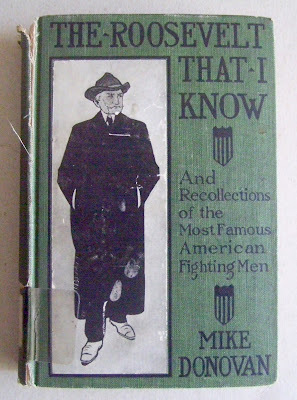 I browsed his stock online before leaving Florida, and he set three books aside for me. We talked about books while I was browsing his shop—I miss that when I browse books online—and I found two more books to my liking in his shop. 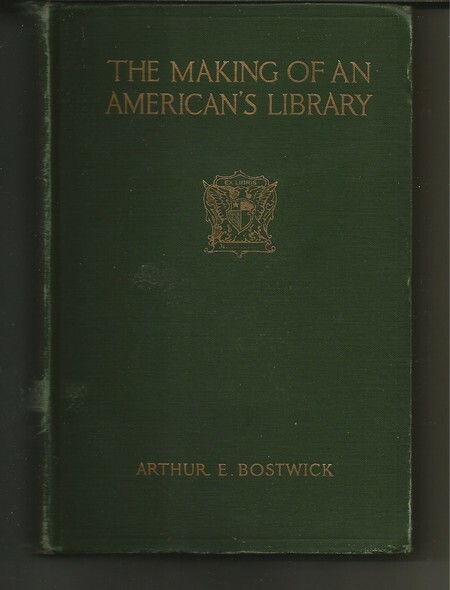 I have the catalogues of several prominent book collectors in my library. And I enjoy seeing which books they acquired for their libraries. Now I've added Rosenwald and his collection of books from the fifteenth through eighteenth centuries to the fold. 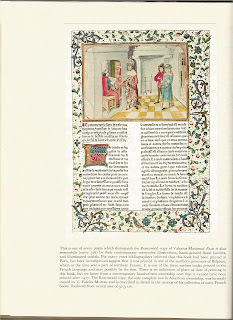 To the right is one of the thirteen illustrations from books and manuscripts in the Rosenwald Collection. No. 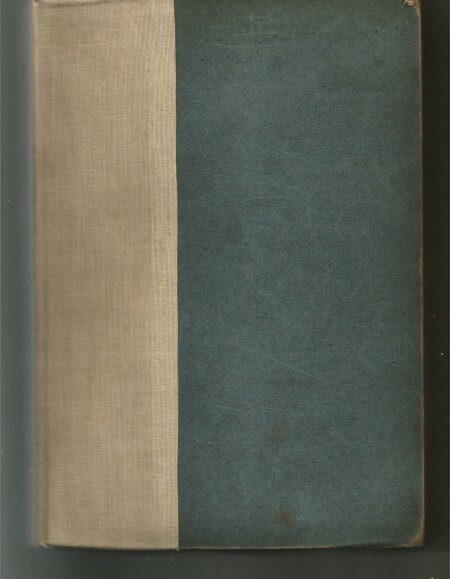 182 of 425 copies printed by Theodore DeVinne. I bought this primarily for my Austin Dobson collection. 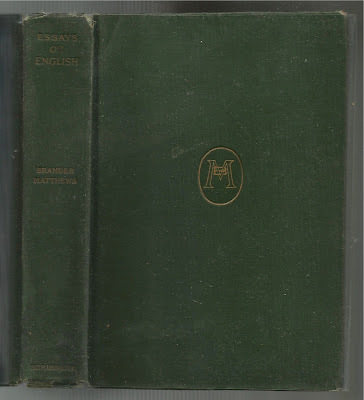 But I have a set of Walpole's Letters and thought I should have his memoir too. The appendix of Strawberry Hill Press books is icing on the cake. 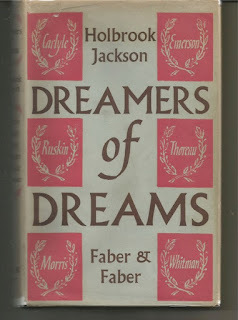 Dreamers of Dreams: The Rise and Fall of 19th Century Idealism by Holbrook Jackson, London: Faber and Faber, 1948. 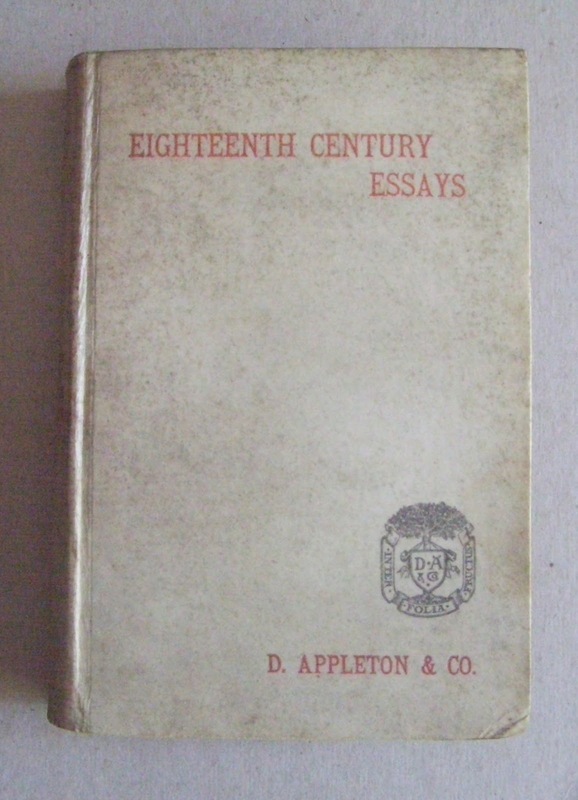 Holbrook Jackson examines the lives and writings of six nineteenth century writers: Thomas Carlyle, John Ruskin, William Morris, Ralph Waldo Emerson, Henry David Thoreau, and Walt Whitman. 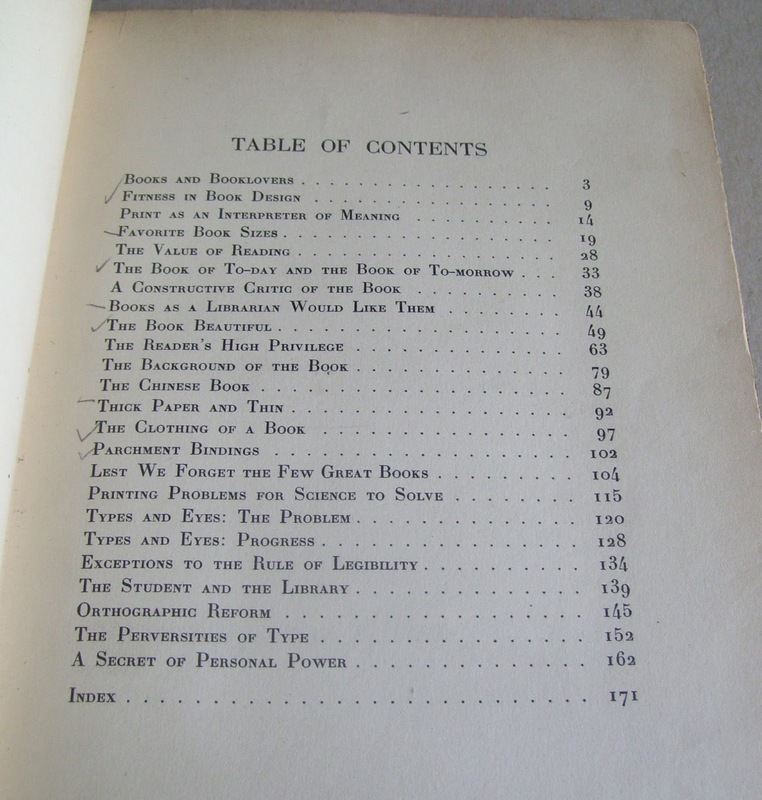 From the bibliographical library of William P. Wreden, with editorial corrections and marked paragraphs in his hand. 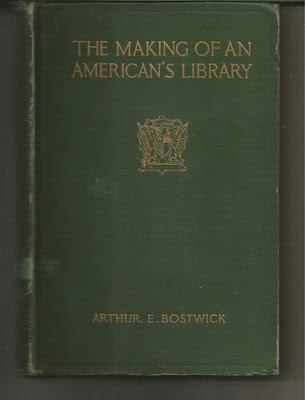 Bought because the chapter titles sound as interesting as the book title: Books as Room-Mates, The Art of Browsing, A Literary Laboratory, the Boy and the Book, and Recuperative Bibliophily. The Booklover And His Books by H. L. Koopman, Boston: Boston Book company, 1917. A word about Koopman's quotation, which I borrowed to open this blog post: I am always a booklover, most times a reader, but sometimes just a collector. In short, I don't read everything I collect. Brendan has an extensive selection of books about books. 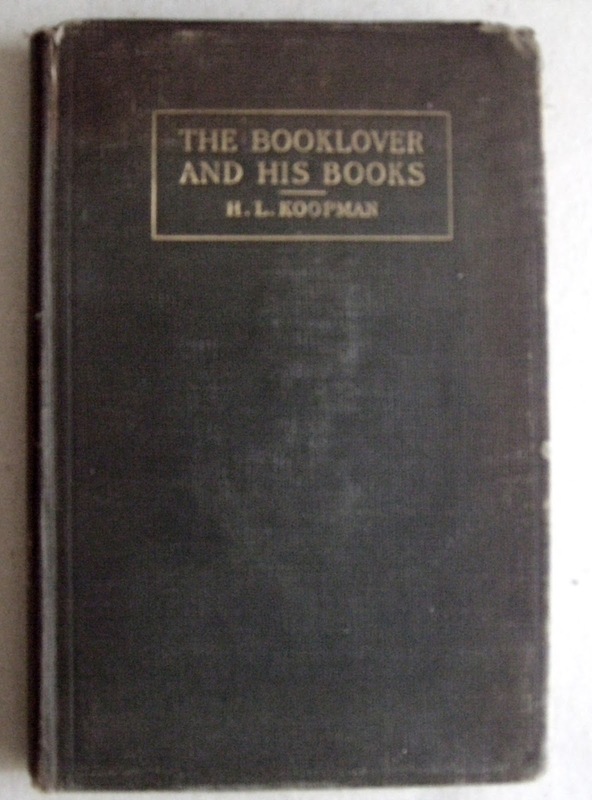 And The Booklover And His Books by Harry Lyman Koopman (1860-1937), the librarian at Brown University for thirty-seven years, will appeal to those who love "The Book Beautiful." We then visited my friend Terry Seymour who lives nearby in Center Valley. Terry gave me a tour of his books, interspersed with lots of book talk. And then we took our wives out to dinner. 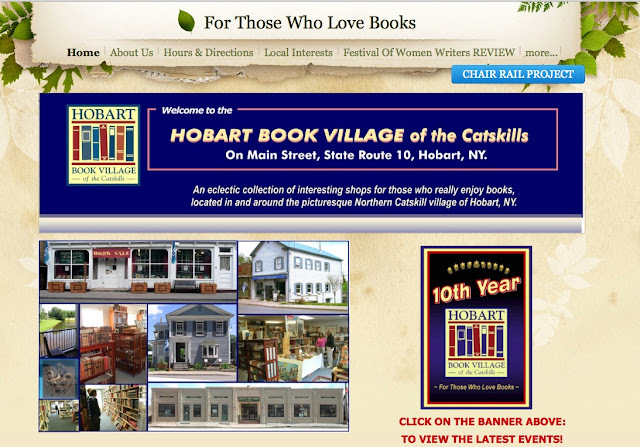 The next day my wife and I crossed over the Tappan Zee Bridge and on to my sister-in-law Annie's house in West Harrison, N.Y. We visited Hobart Book Village the next week, where I bought even more books. We arrived at Hobart around noon on Tuesday, June 9th, and had lunch at The Coffee Pot, located right on Main Street near the bookstores—I recommend the corned beef sandwiches! 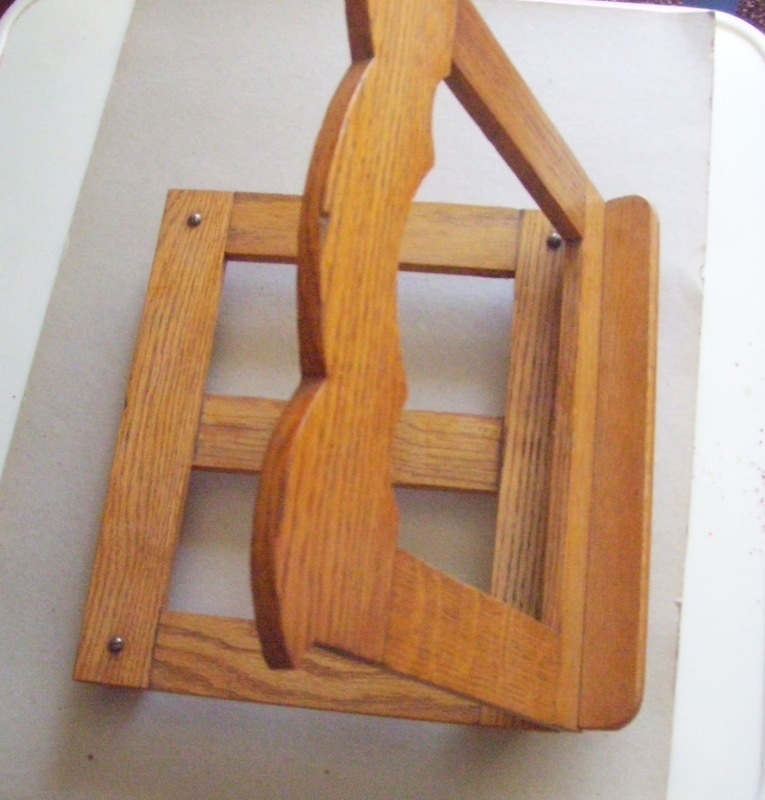 The girls (my wife Linda and my sister-in-law Annie) took off to look for antiques at Second Wind Furniture. 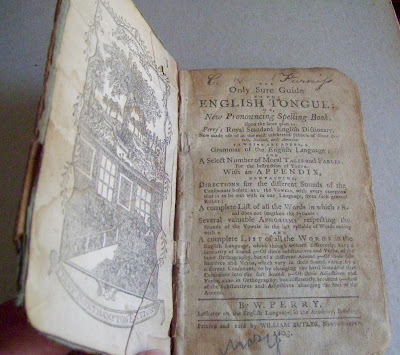 I walked over to Adams' Antiquarian Book Shop, and a little while later it started pouring. I left my umbrella in the van—six percent chance of rain for Hobart—but Bill Adams lent me an umbrella so I could visit the other bookstores as well. I had the town to myself. In fact, three of the bookstores were closed. But Bill Adams granted me access to all the bookstores. And I browsed the stock of four of them. All told I bought six books in Hobart Village. 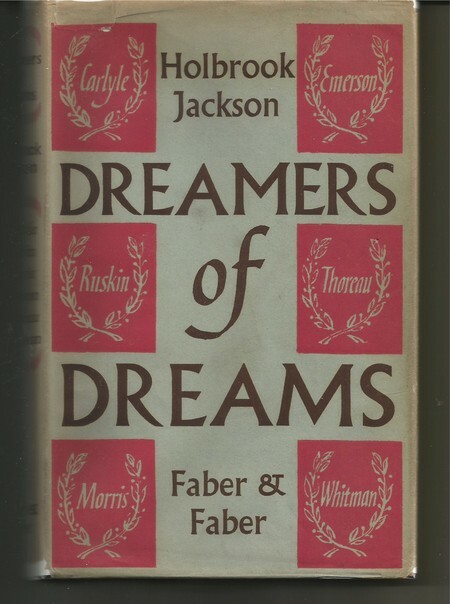 Adams' Antiquarian Book Shop had perhaps the best stock—and I didn't even go up to the third floor where the high-end collectible books were. 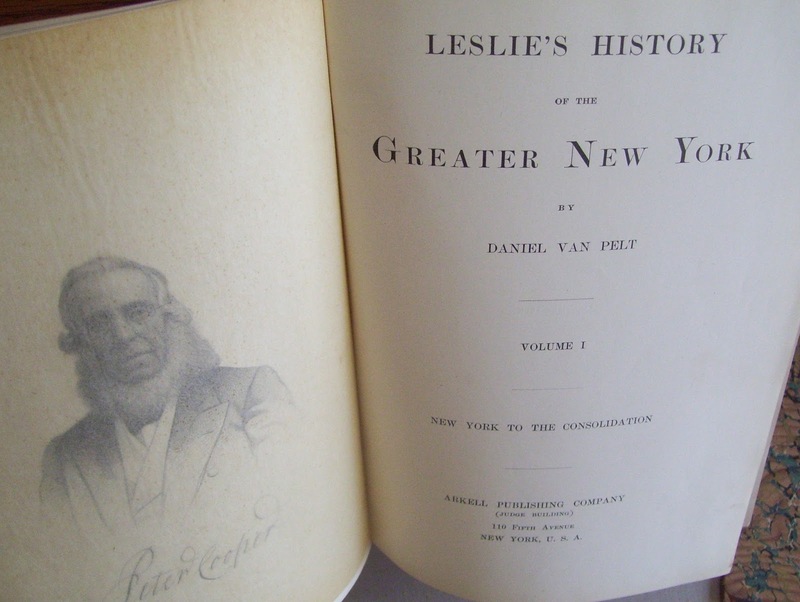 Adams' had an extensive section of books on New York, but not the set I was looking for: Leslie's History of the Greater New York by Danial Van Pelt, published in three volumes in New York by Arkell Publishing Company in 1898. 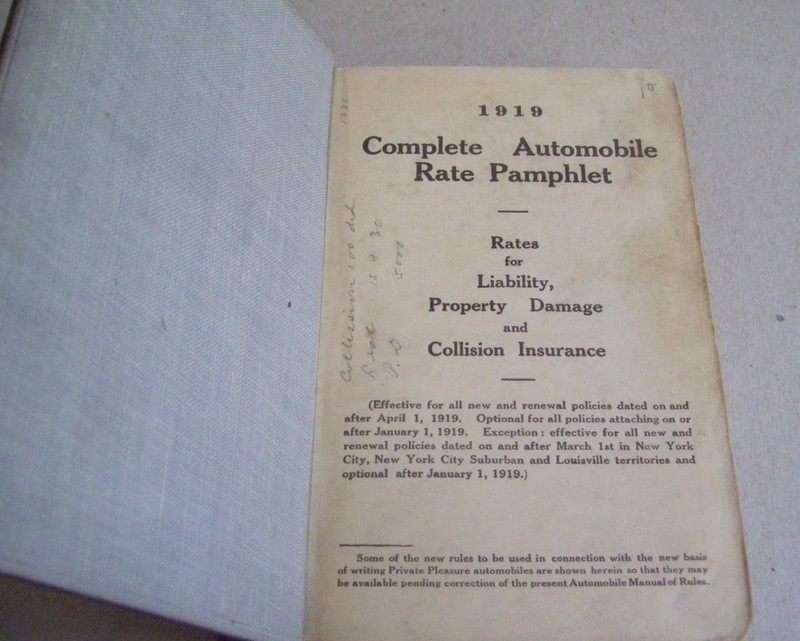 Collision rates were based on the list price of the vehicles. Depending on the body type, the 1919 Model T Ford was listed from $475 to $775. 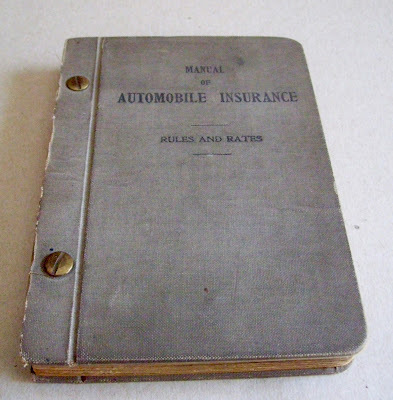 Add $75 if the car was factory-equipped with a self-starter, and $25 if it had demountable rims. 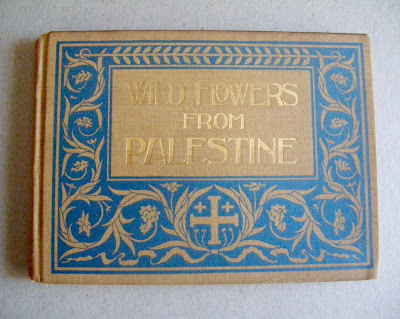 Pressed flowers from Palestine are pasted to the pages of this book. 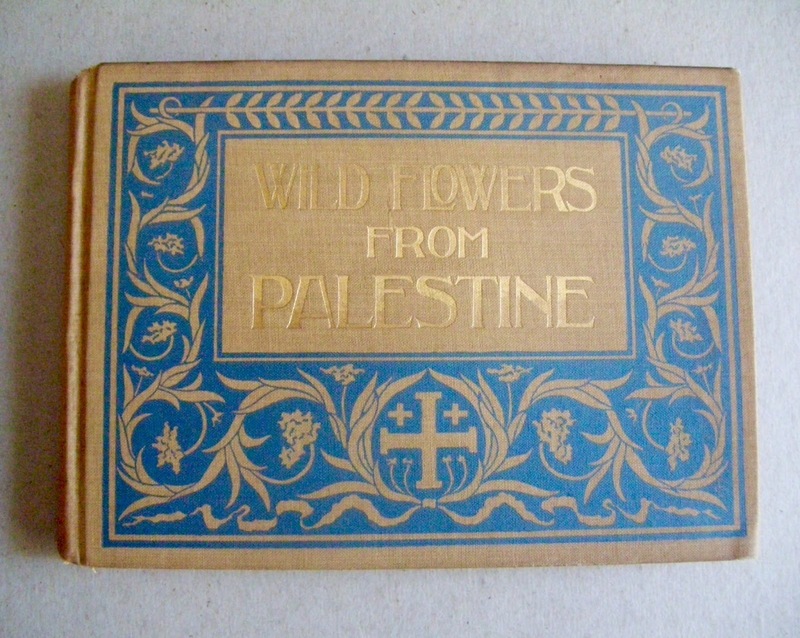 I already had one of the author's other books: Wild Flowers From the Bay State. I found two books to my liking at Blenheim Hill Books as well. This store had a varied assortment of stock and I enjoyed browsing it. 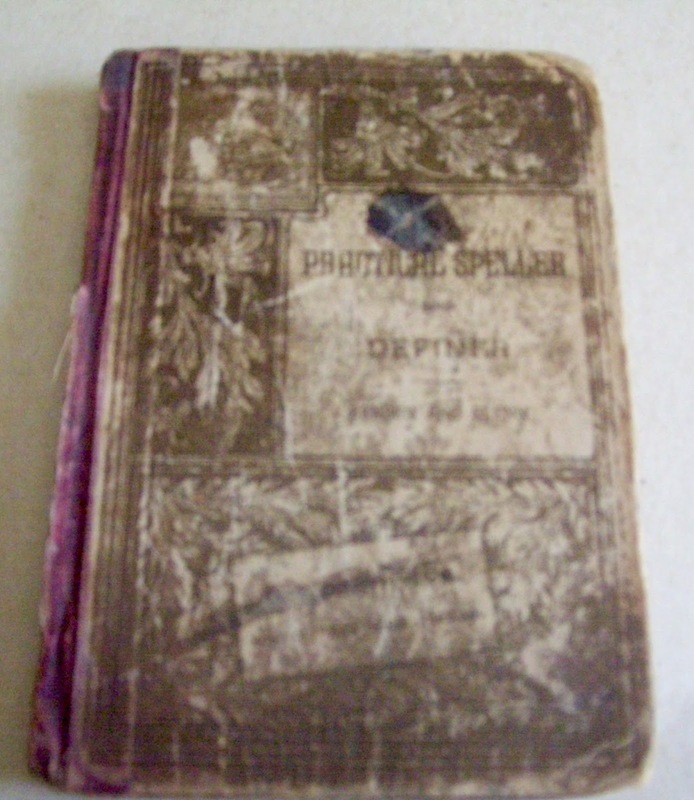 This book is dedicated to Julia Ward Howe, whom I've mentioned in two recent blog posts. And the Battle Hymn of the Republic is reprinted in the dedication. 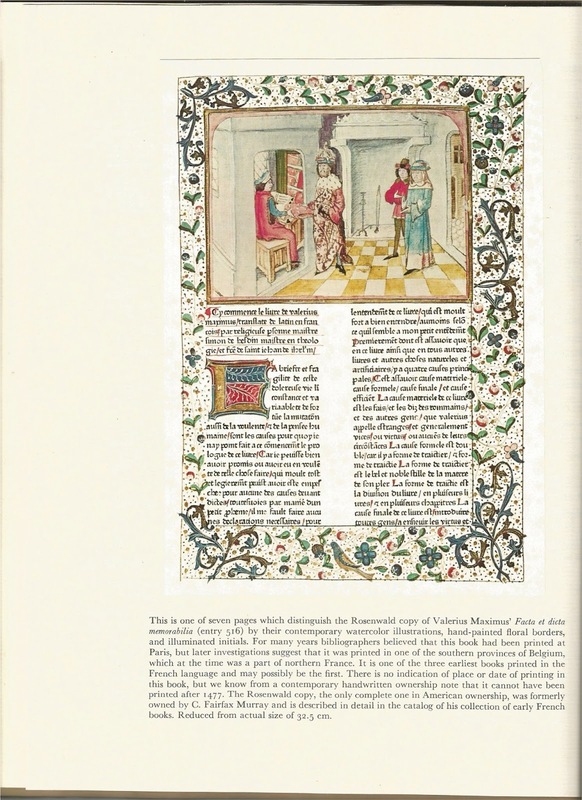 The book itself is a series of articles —a call to arms, of sorts— most of which were previously published in contemporary periodicals. 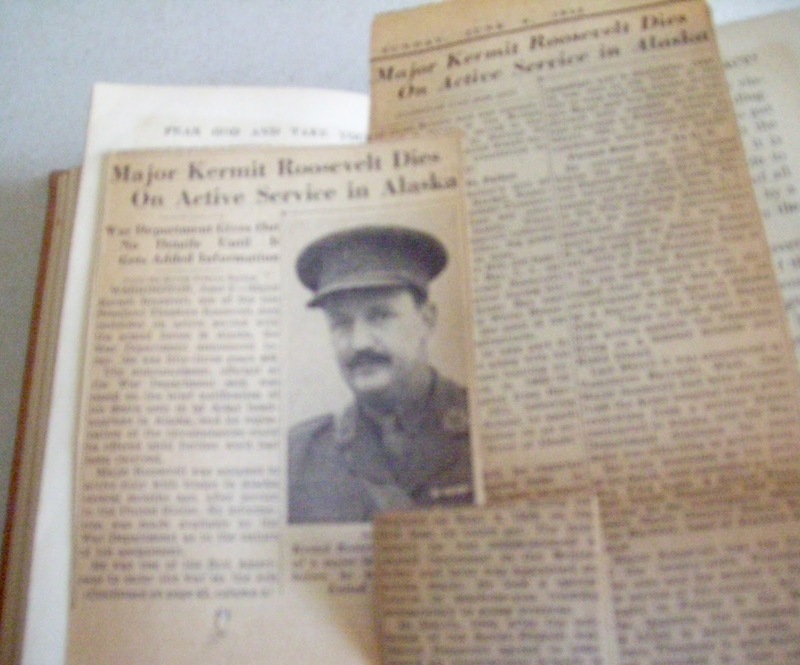 Inserted in the book was a newspaper article about the death of Kermit Roosevelt. I have a book formerly owned by Kermit Roosevelt, and wrote about it in a 2013 blog post. I was curious to see if the newspaper article mentioned Kermit's suicide by gun—it didn't. Found later in the book was this curious sheet of pencilled portraits labeled Father, Sir T. Fairfax, French Commander, Dinwaddie(? ), and Braddock. 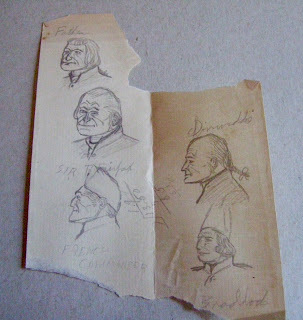 Fannie C. Cartwright, a former owner, appears to be the person who drew these portraits. 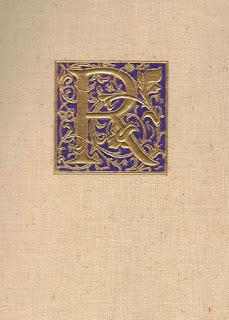 The watermark on the paper itself (Irish Linen [Bond?] 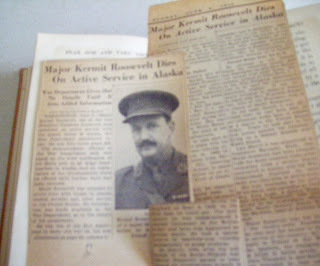 dates the paper to around 1920. I have no idea concerning the significance of these drawings. Eighteenth Century Essays by Austin Dobson, New York: Appleton & Co., 1882. 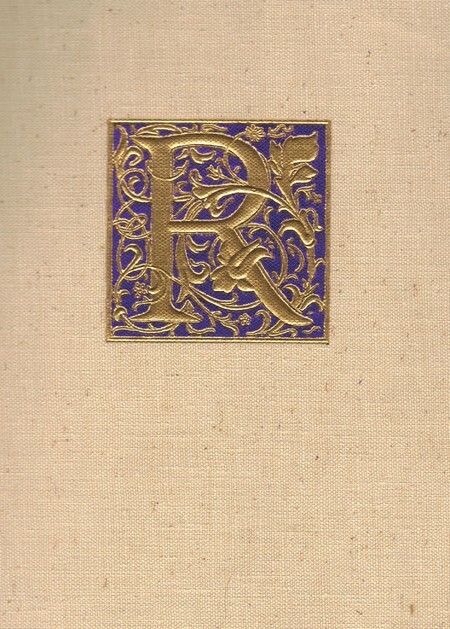 I have a later edition of this work, but wanted to upgrade to vellum, which I shall clean later. This is the thirty-fifth book in my Austin Dobson Collection, and I just may do a blog post on my Dobson books at a later date. 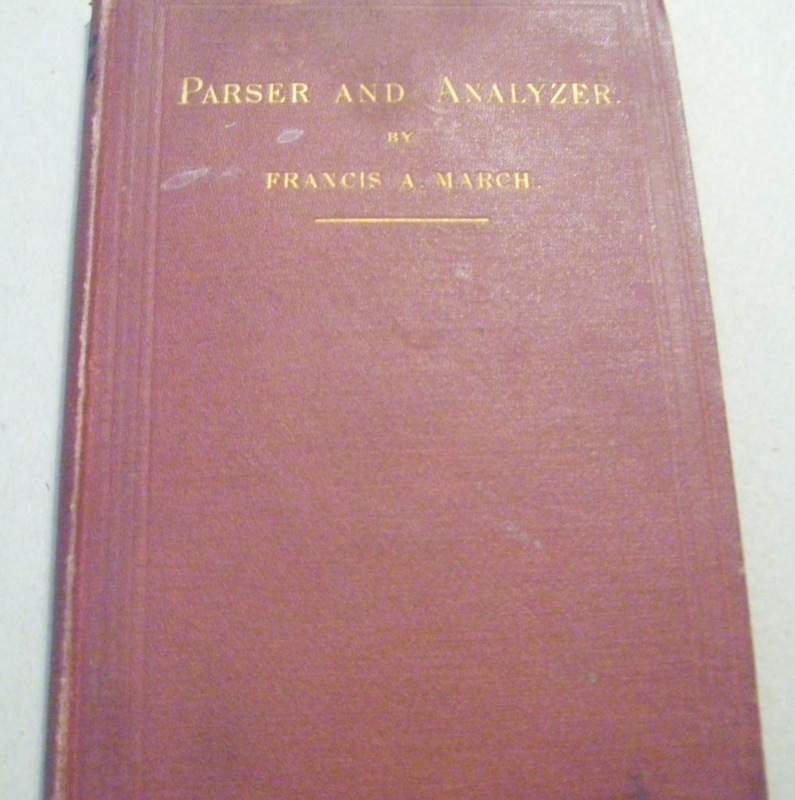 I found two books at Adams Antiquarian Book Shop as well, both for my Philology Collection. The Only Sure Guide to the English Tongue, Or, New Pronouncing Spelling Book: Upon the Same Plan as the Royal Standard English Dictionary ... to Which is Added an Appendix Containing Several Very Useful Lists of Words Properly Accented, Which Had Been Omitted in the Last Three Editions by William Perry, Chief Lecturer, Edinburgh University, published in Northampton, (Scotland Massachusetts: printed and sold by William Butler, 1803. 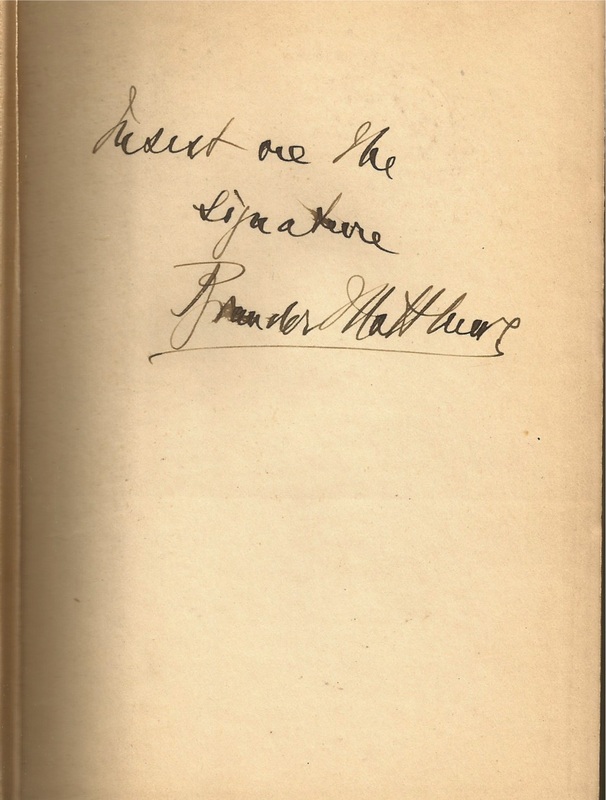 This is the second signed book by Matthews that I have in my library. And he used the same words both times: Insist on the Signature. I took a quick look in Mysteries and More for a book I wanted to buy for my brother-in-law; but I couldn't remember the name of the author—it was Stuart Woods (I ordered the book online later that week). I bypassed Liberty Books because I saw the girls were already waiting in the van. Although the girls were impressed with the quality and the pricing of the antiques in Second Wind Furniture, they were done browsing in thirty minutes, and waited for me in the car for an hour and a half. Note to self: Go to Hobart alone next time. Hobart Book Village was the third book town I have visited, and I enjoyed visiting all three of them: Hay-on-Wye in 1988; Archer City in 2011; and now Hobart Book Village in 2015. I regard this as a feat of sorts. Baseball has its triple play. Hockey has its hat trick. And horse racing has its trifecta. The sport of book collecting should have its own term for the feat accompli of visiting three book towns. 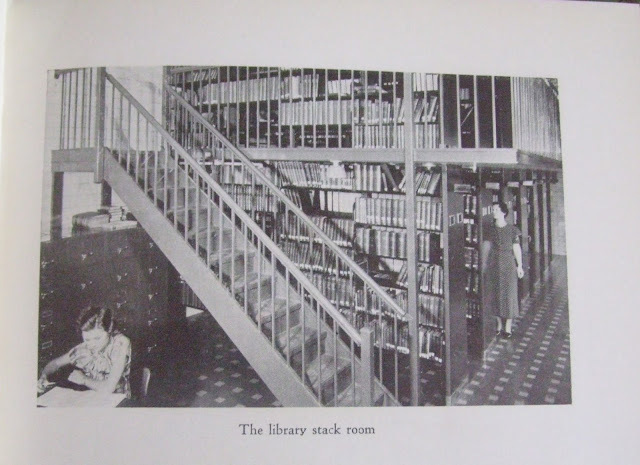 How about biblio-triplicity? 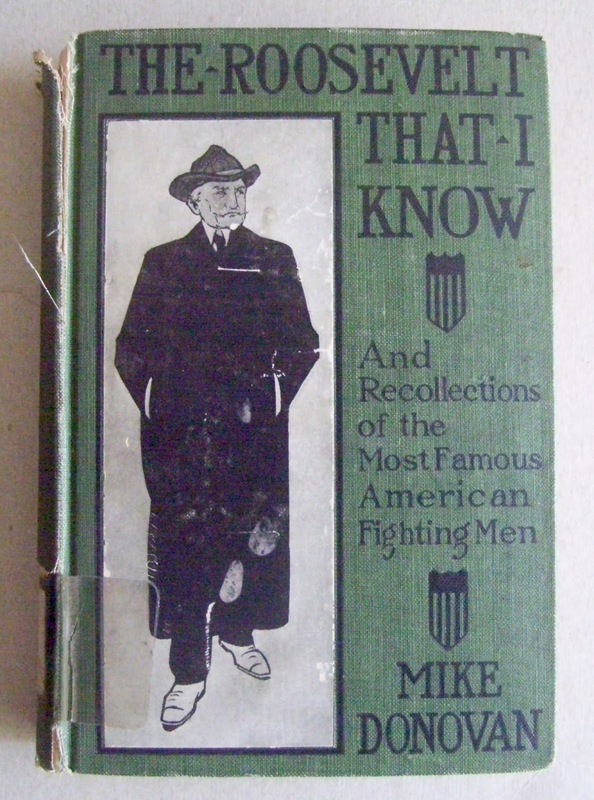 The Roosevelt That I Know: Ten Years of Boxing With the President—And Other Memories of Famous Fighting Men by Mike Donovan, New York: B.W. Dodge & Company, 1909. Note to self: spine cloth split; find matching cloth and repair it. 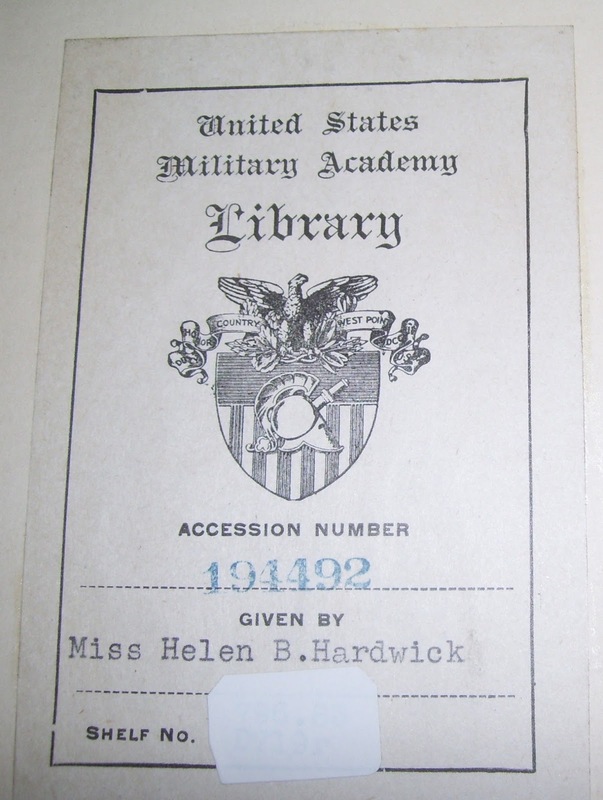 Helen B. Hardwick, in turn, gave this copy of the book to the West Point Library in 1942. The date of acquisition, 6/24/42, is written in pencil in the gutter of the Preface page. 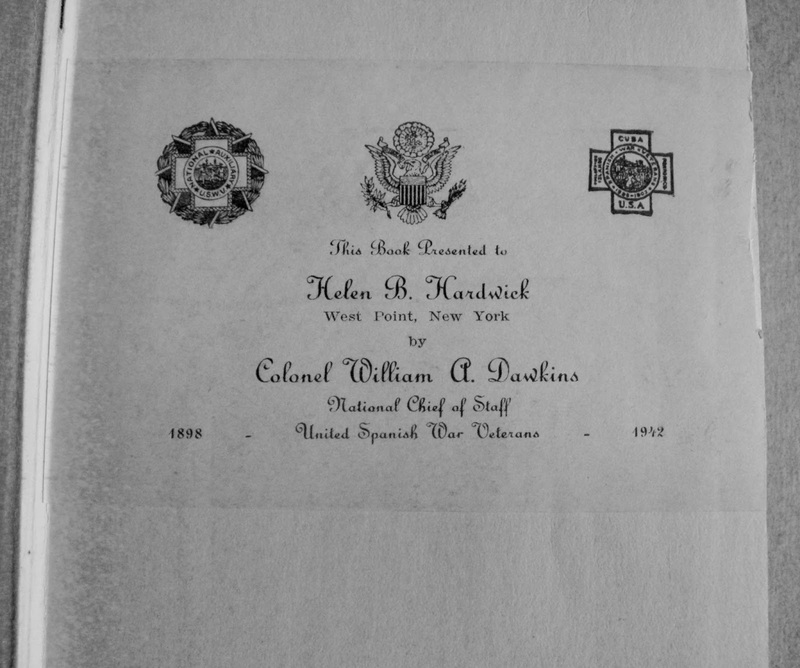 The date of deaccession, 11/94, is written in pencil on the copyright page, next to the letters WD (withdrawn). Colonel William A. Dawkins was a commander of a regiment from Brooklyn during the Spanish American War. 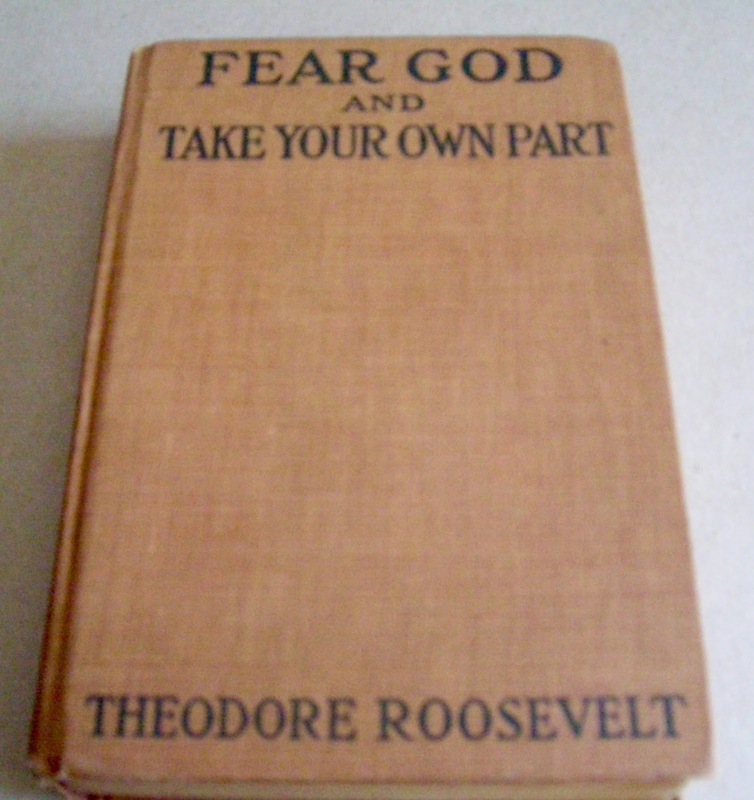 I have yet to find any other connection between him and Teddy Roosevelt. But I'm still researching! 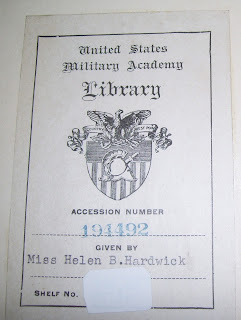 And I'm still researching Miss Helen B. Hardwick. 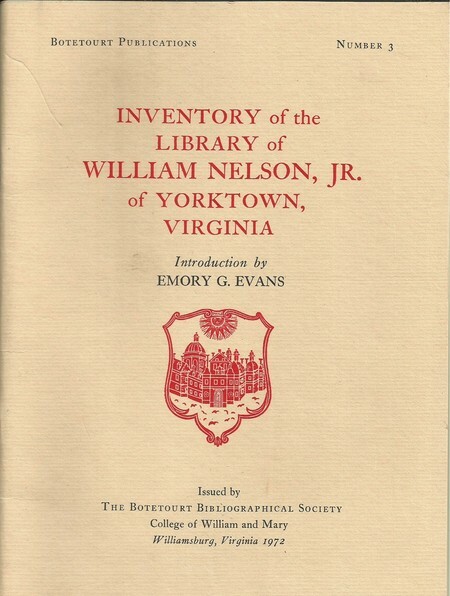 Inventory of the Library of William Nelson Jr. of Yorktown, Virginia Issued by the Botetourt Bibliographical Society, College of William and Mary, Williamsburg, 1972. 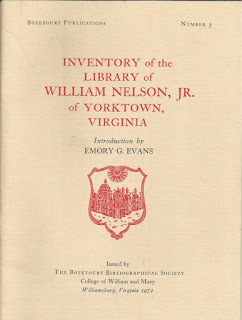 A catalogue of some of the books in the private library of William Nelson Jr. (1763-1803). I acquired a couple of inexpensive books for my NYC Collection, which I will mention in my NYC blog post later this year. And then there's this book I bought because I thought it was about trolleys in the suburb of Queens, which is where I grew up. 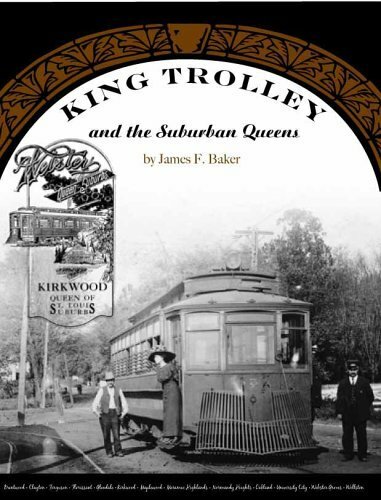 But had I taken a second look at the front cover, I would have noticed that the book was about trolleys in Kirkwood, the "Queen of St. Louis Suburbs." My wife regards this place as Antique Heaven. And it will be a stopping place on all future trips north. We spent an hour and a half at the Factory Antique Mall, and saw less than half of the over 100,000 feet of antiques. I bought five more books. And my wife bought over $250 worth of antiques! There were several booths that had books and at least two booths that had nothing but books, one of which had several thousand books, and in all different genres. 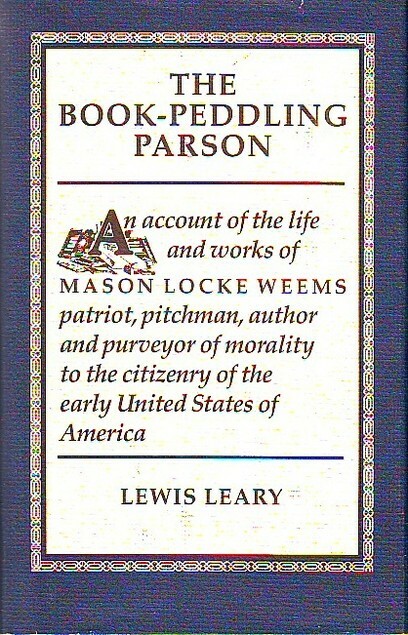 The Book-Peddling Parson: an Account of the Life and Works of Mason Locke Weems: Patriot, Pitchman, author And Purveyor of Morality to the Citizenry of the United States of America by Lewis Leary, Chapel Hill: Algonquin Books, 1984. 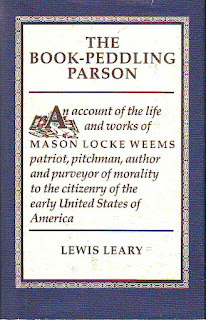 I had seen several books on the web about Weems, and buying this book was a no-brainer. I'm looking forward to reading it. 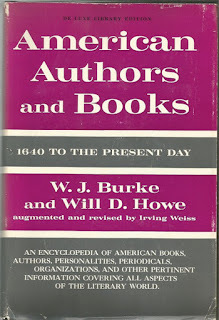 American Authors and Books: 1640 to the Present Day by W. J. Burke and Will D. Howe and augmented and revised by Irving Weiss, New York: Crown Publishers, 1962 (First published in 1943 by Grammercy Publishing Company). I buy some books for their contents. But I bought this book because Will D. Howe was one of the authors. 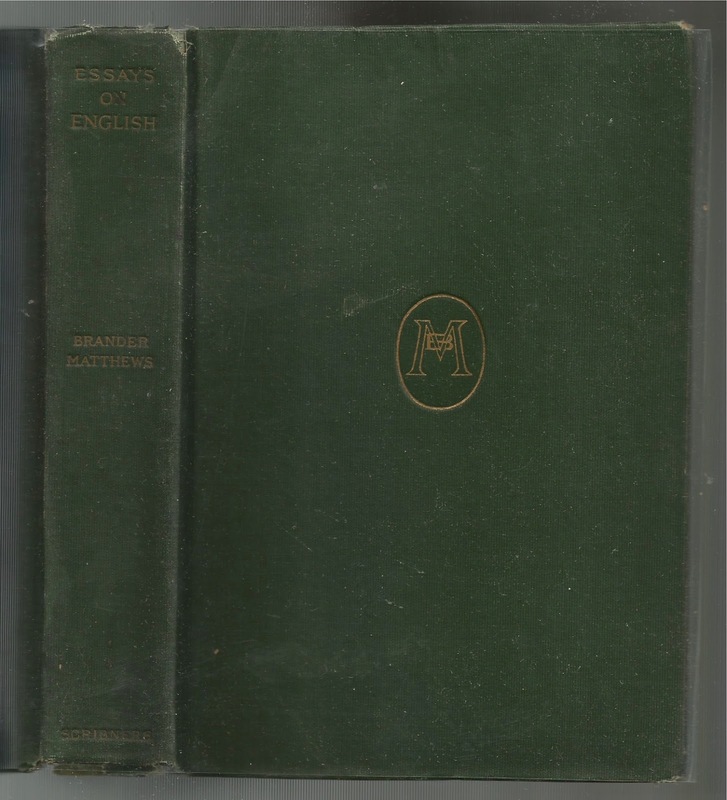 Will D. Howe was one of the publishers of the elusive 1920 first trade edition of William Strunk's book, The Elements of Style. Howe left the firm of Harcourt, Brace, and Howe shortly after Strunk's book was published. 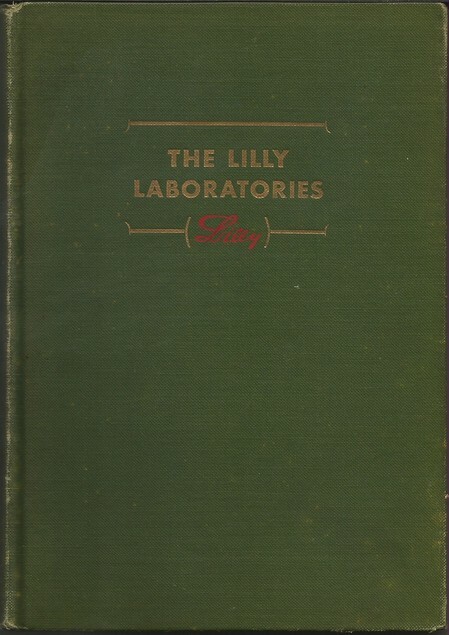 The Lilly Laboratories by Eli Lilly and Company, Indianapolis, circa 1942 (published without a title page). I have a few books about J. K. Lilly and the Lilly Library in my own library. And now I have a picture of the first Lilly Library—the one located in the Eli Lilly Research Building. 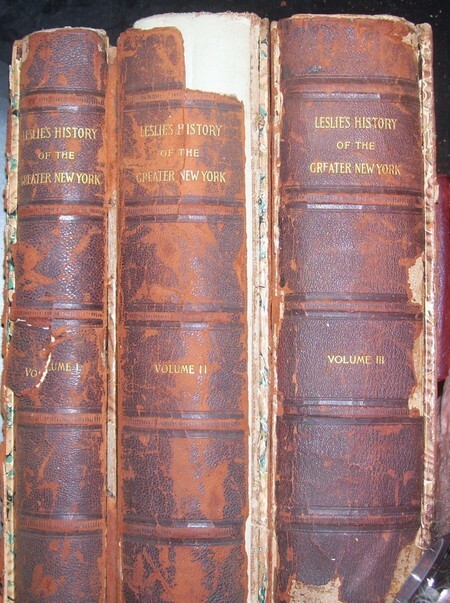 Leslie's History of the Greater New York by Daniel Van Pelt, New York: Arkham Publishing Company, 1898. The text blocks are completely intact. 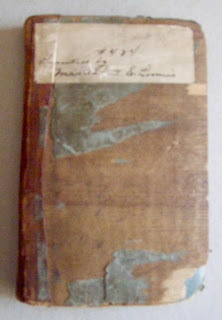 And I will retain the endpapers and the marbled paper on the boards. Note to self: Smile when you reback these books!